Rove: out of White House, into jail? 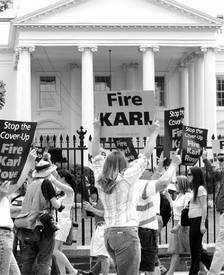 WASHINGTON — It is an open question whether Karl Rove, deputy White House chief of staff, will keep out of jail, given the flood of evidence that he broke the law in identifying covert CIA operative Valerie Plame to reporters. But backstabbing and dirty tricks have been Rove’s weapons of choice in Texas for 35 years, according to people who have followed his career in the Lone Star State. They cite his success in smear campaigns that drove from office popular Texas politicians like Agriculture Commissioner Jim Hightower, Gov. Ann Richards and Rep. Lloyd Doggett. He replaced them with hard-line, ultra-right Republicans and transformed the state into a stronghold of rabid right-wing Republicanism. Rove’s role in leaking Plame’s CIA connection “is consistent with the way he has operated for years in Texas,” McDonald told the World in a telephone interview from his Austin office. “Rove believes that it is necessary to smite his enemies, knock them down and make sure they don’t get up again.” It is a “mean-spirited” mentality, he said. The Bush-Cheney administration was enraged that Plame’s husband, former ambassador Joseph Wilson, had gone to Niger before the Iraq war to look into a possible uranium purchase by Iraq, and had reported that there was no evidence of such a deal. Then, in a New York Times op-ed, he blasted Bush for lying to the people in citing the uranium deal to justify the invasion of Iraq. Shortly afterward, his wife’s identity was leaked to the media. It was widely seen as an effort both to discredit Wilson and damage his family. President Bush, who vowed to fire anyone who leaked Plame’s identity, has shifted ground, promising that the leaker will be fired only if a “law was broken.” “Outing” a covert agent was made a crime under the Reagan administration. “Bush’s Brain,” a political biography of Rove by Dallas Morning News reporters James Moore and Wayne Slater, reveals that Rove’s political skullduggery dates back to 1970 and was an important factor in the ultra-right’s rise to power in the U.S.
Rove was a Young Americans for Freedom operative working for the GOP in Illinois that year. Posing as a Democrat, he infiltrated Alan Dixon’s campaign headquarters in Chicago a few days before its official opening. Dixon was a Democratic candidate for state treasurer who later served in the U.S. Senate. Rove stole campaign letterhead and made up a fake invitation to the Dixon opening with promises of “free beer, free food, girls, and a good time for nothing.” He distributed 1,000 copies at soup kitchens. Hundreds showed up. Richard Nixon’s chief dirty trickster, Donald Segretti, went to jail for similar acts in the Watergate scandal. When Bush and Cheney saw their lead disappearing in Florida in the post-election battle, Rove recruited 250 goons to terrorize election officials to halt the vote count.